Since 1975, Airmix® combines conventional and high pressure Airless technologies advantages. 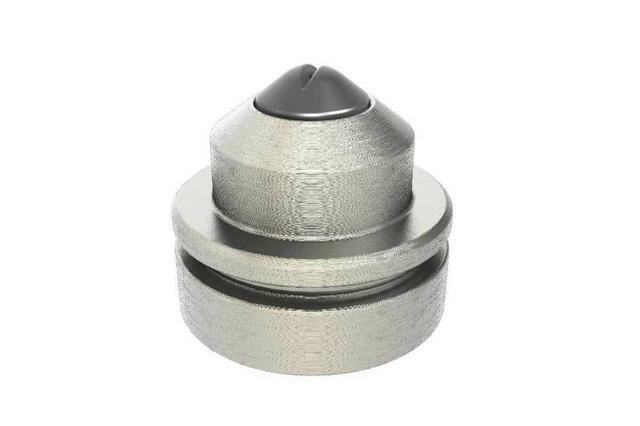 It is today's industry standard for medium pressure atomization. A little history on Airmix® (AAA) spray technology. In 1975, SAMES KREMLIN has been the very first spray equipment company which invented the first generation of Airmix® technology (AAA) and launched the kremlin spray gun in the wood industry. 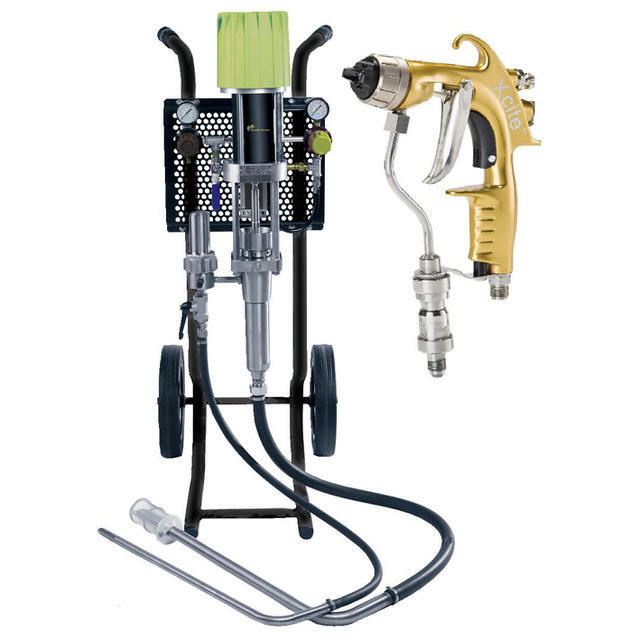 It is a combination of high pressure airless paint sprayers and airspray. This concept was such an great success for a large number of users that it launched Airmix® from a commun technology to a well-known and reliable first category industry standard used all over the world in many business areas where high quality finish is a must. 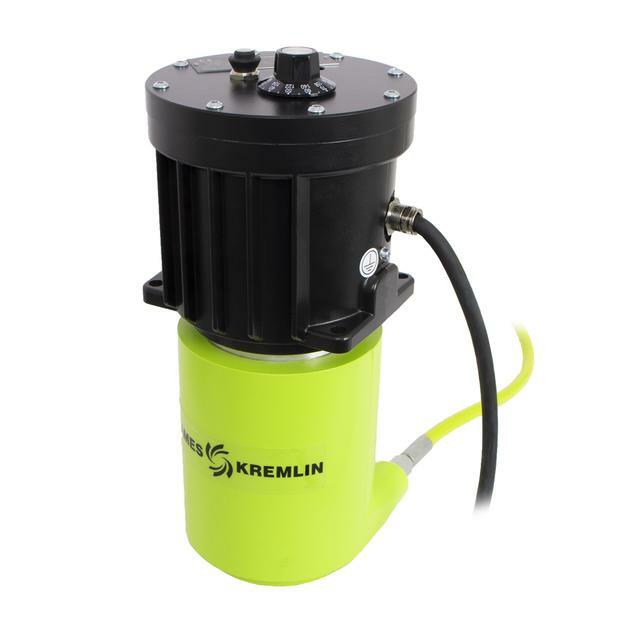 Driven to maximize customer benefits, SAMES KREMLIN developed a second generation of Airmix® (aaa): Gun Aircap Adaptation allows to atomize while modifying the fan spray pattern width without changing the fluid tip saving time & money. 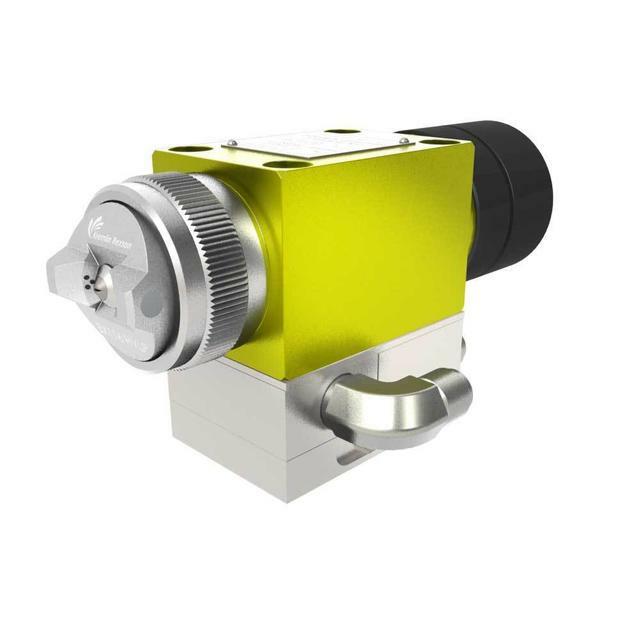 Airmix® HVLP (Hvlp air assisted airless) with the XCite soft trigger is ideal for small to large productions (kitchen cabinets, industrial equipment). Painter reviews shows that Airmix® users are convinced that painting parts with difficult to reach areas is much more easy with a perfect and high quality result: it's a great tool! Compared to air assisted airless sprayers. Furthermore, Airmix® uses low 0.3 to 3 bar compressed air. 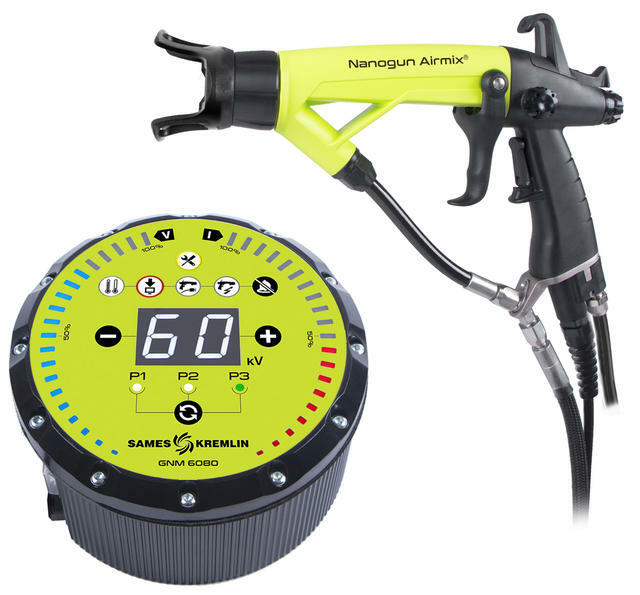 Also avalaible in electrostatic version with the nanogun Airmix® manual electrostatic gun. Why is Airmix® liquid spraying technology so popular? 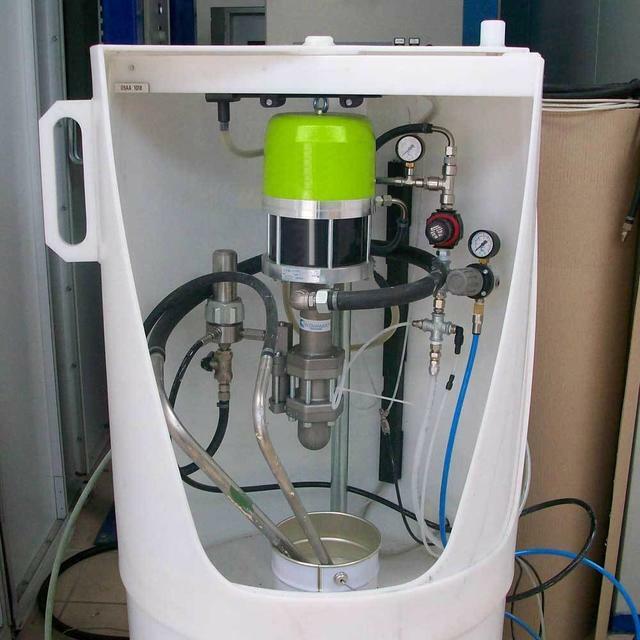 Airmix® is a unique medium fluid pressure spraying technology in between Airspray (known for high finishing quality with limited fluid flow rate ideally under 400cc/min) & high pressure Airless (known for good results for high fluid flow but without quality finishing). 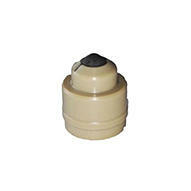 It is compliant with environmental protection policies. Airmix® (or Air Assisted Airless for our competitors) gives a high finishing quality & uniform film build control for high productivity on paint flow rates from 400 to 2000 cc/min with a consistent spray pattern to perfectly atomize small to large amount . 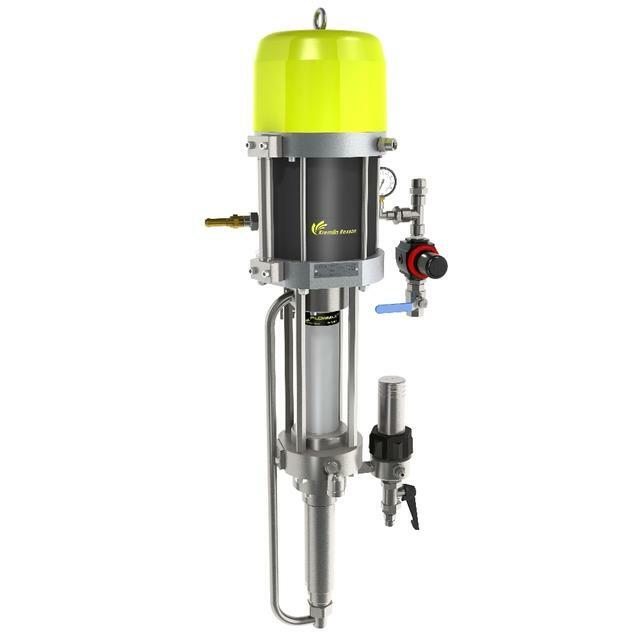 Fed by air compressors, Airmix® pumps (with powerful air motors) and guns, featuring all set-ups, with accurate fluid pressure regulator control, are ideal to atomize most products. Our very flexible fluid and air hoses improves the gun maniability. 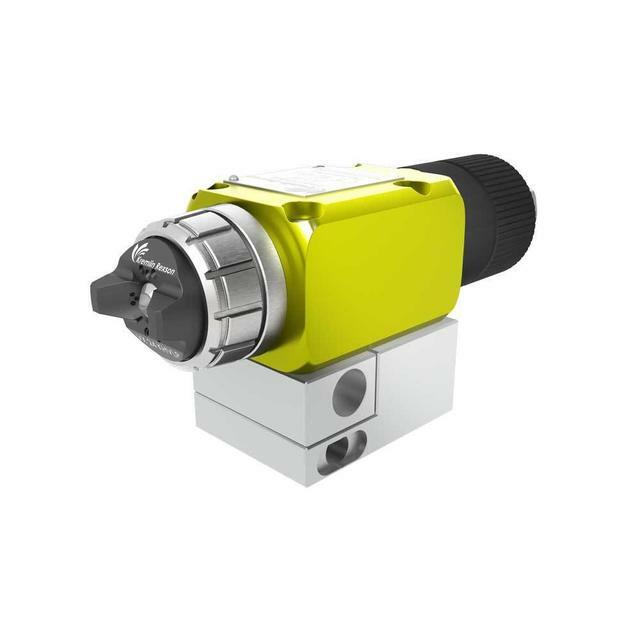 Depending on configurations specifications, all components are available in solution packaged. 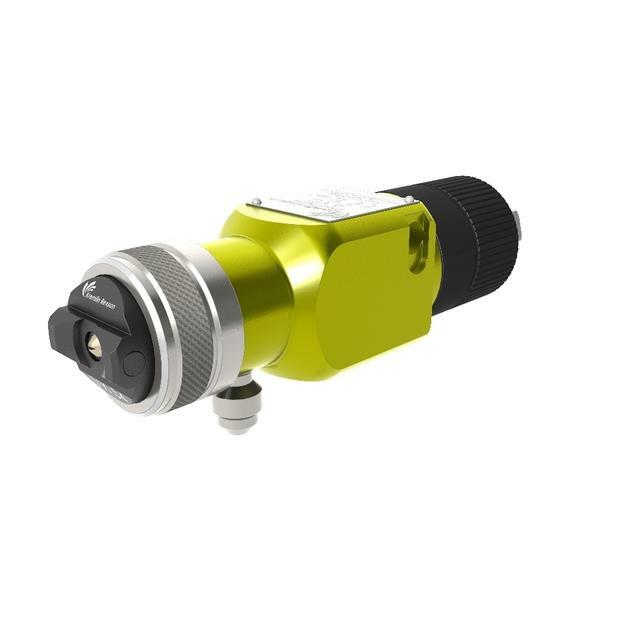 As for airless spray gun, increased operator safety is ensured with trigger lock and aircap protection. Airmix® is not recommended for sealants and adhesives. Unattainable benefits from other medium pressure technologies such as Air Assisted Airless (aaa) or hvlp air-assist airless. It is also important to take into account that Airmix manual electrostatic guns are also available on the market. To better atomize with the addition of low pressure compressed air amount to both sides of the fluid fan pattern. Available setups allows for fine reviews and control of all parameters. More on this great tool on our website for brochure download (giving full data description of customer's benefits and specifications) or details on configurations available (wall mounted or mobile versions, packages kits for small business) or videos on our Youtube channel! You can also contact us by email for specific queries. Plus also a quick access to instruction manuals for easy repair and benefit from our expess logistic part posting. Why choose our high quality tips? To make sure that every tip built in our factory yields the best results, we follow a precise machining process that guarantees consistent material output at different spray angles each & every time. 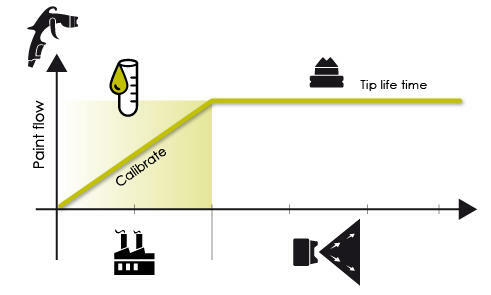 Our tips are built with carefully selected materials to guarantee a lifetime production. 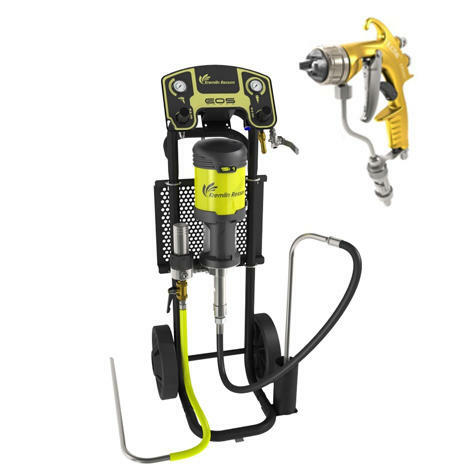 Flowmax® paint pump for medium pressure applications. Recommended for all materials, including water-based and high solids. Airmix® spray tip dedicated to ATX and AVX automatic guns, developed to spray on drums and gas bottle. The asymmetrical shape guarantees an even coating when you spray from the side at 60° (not perpendicular). 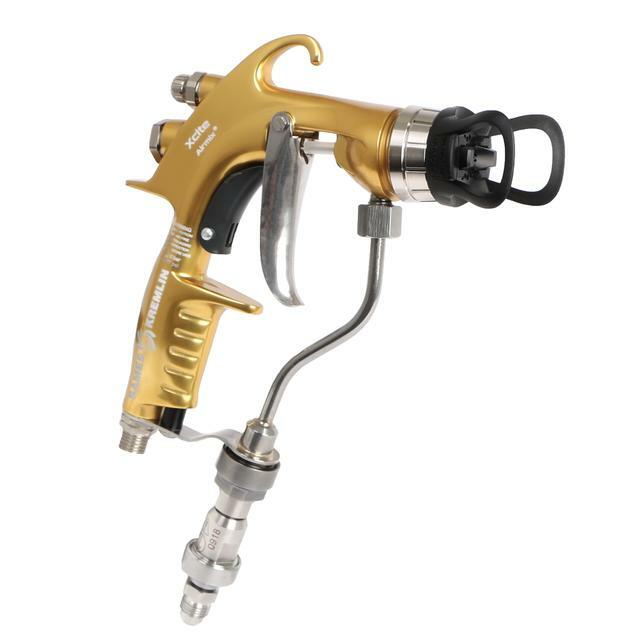 Airmix® spray tip is dedicated to automatic range and manual Xcite™ gun . Recommended for solvent based paint. 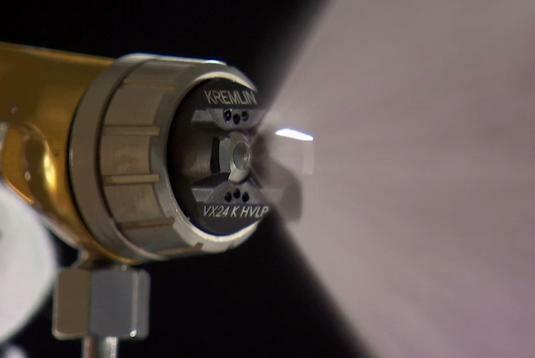 Airmix® spray tip is dedicated for automatic electrostatic Airmix® KAX range and manual Airmix® KMX gun . Recommended for water based paint. 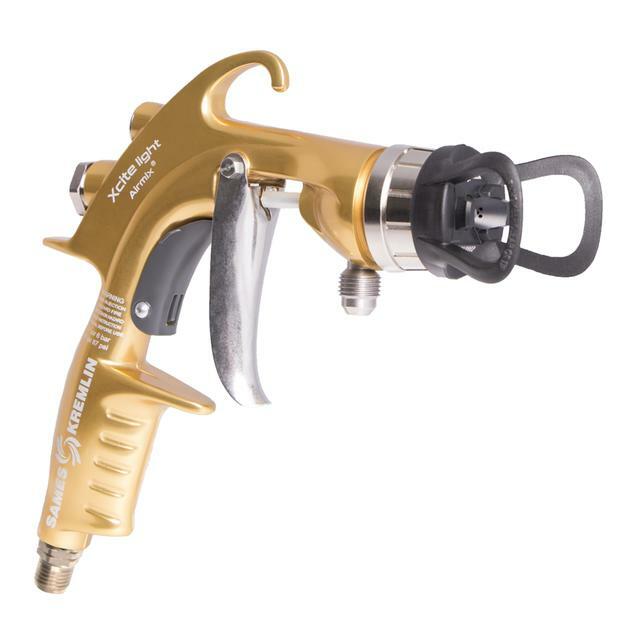 Airmix® spray tip is dedicated to automatic range and manual Xcite™ gun . Recommended for water based paint. 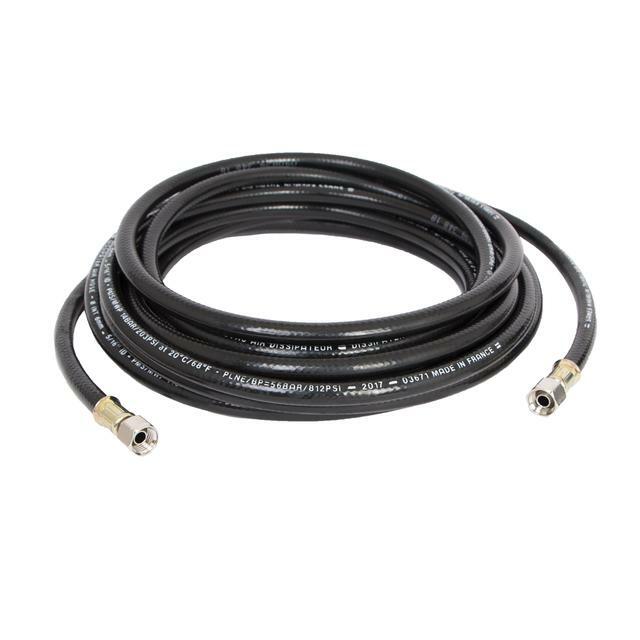 SAMES KREMLIN's new air hoses bring unique advantages to the end user because they are exceptionally lightweight and flexible. The new version of the automatic Airmix® spraying gun ensures high level performance with unsurpassed finish quality of pulverization due to Airmix® technology; recommended for applying UV products. The SAMES KREMLIN Auto Color Medium Pressure Color Change System is an automated paint dispense system available in 4 to 19 color versions. The new version of the automatic Airmix® spray gun ensures high level performance with unsurpassed finish & excellent atomization quality. The new version of the AXC automatic Airmix® spray gun ensures high level performance with unsurpassed finish & excellent atomization quality. 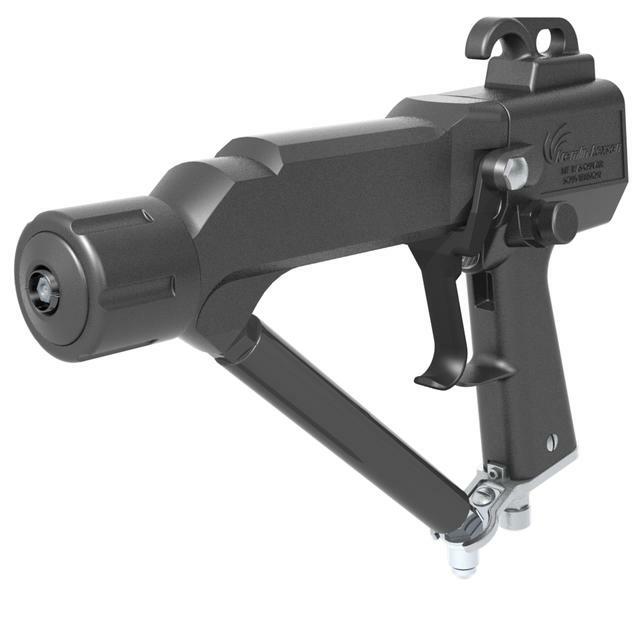 Airmix® automatic electrostatic gun with a swirling fan for maximum wraparound effect on complex parts. KMX3 Manual Airmix® is ideal for parts that require fine finish quality delivered by electrostatic Airmix® technology. 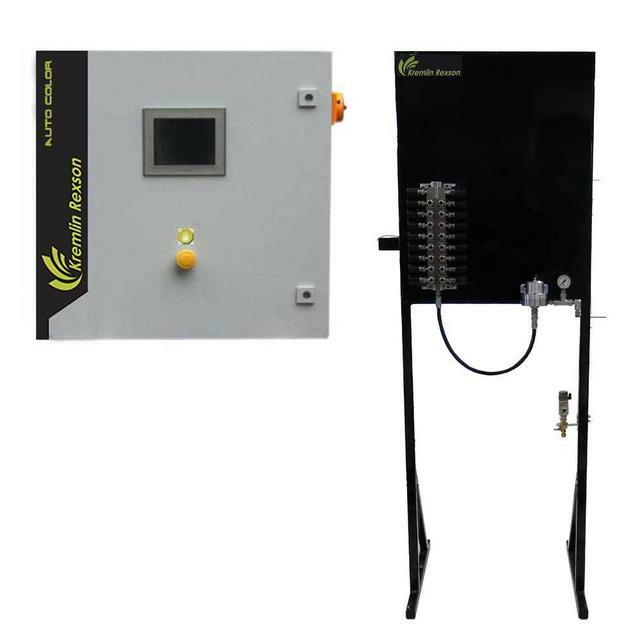 Fluid heater is an optional device used for material preparation and air heating. 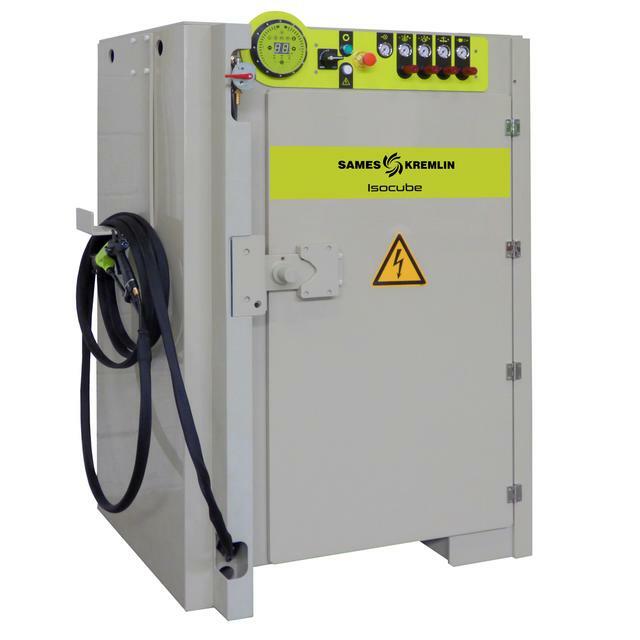 Magma heater range is available up to 500 bar (7250 psi) to supply for heated anti-corrosion applications. 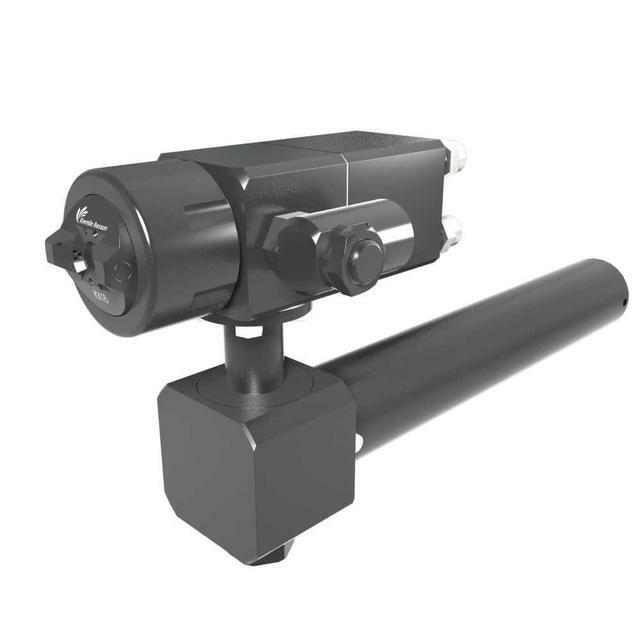 Nanogun Airmix® Manual Electrostatic gun is designed for applying solvent-based materials. Available in 2 pressure calibrations, 120 and 200 bars (1740 and 2900 psi), it meets a wide range of application requirements. Optimum quality of Airmix® spraying - Dedicated to Nanogun Airmix®.